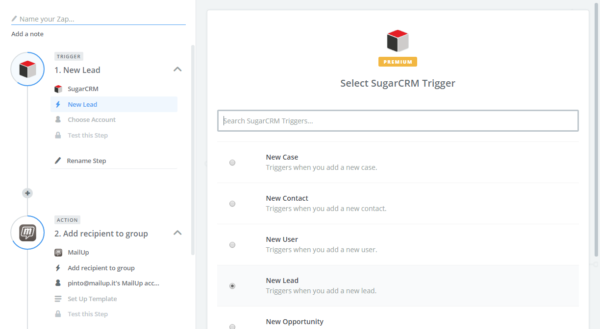 There’s a new subscriber in one of your MailUp lists, and you want that subscriber to become a lead in SugarCRM. When a new order is placed in your WooCommerce store, you want that customer to be added to a specific list in your MailUp account. When you manually add a lead from a trade show in Hubspot, you want it to be automatically added to a “Trade Show Contacts” group in MailUp in the “News and announcement” list. Each combination of trigger and action is called Zap and you can create them as you like, building your own customized integration with MailUp in a matter of minutes. For a list of all the services that can be linked to each other with Zapier, see https://zapier.com/zapbook/. As of November 2016, Zapier supports over 750+ apps and new apps are added and updated every month. Zapier has a limited free plan. Paid plans start at 20$/month.